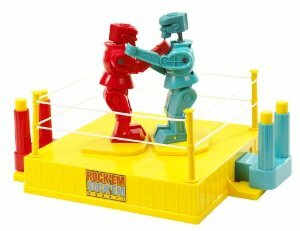 Who remembers Rock ’em Sock ’em Robots? Plastic “robots” in the boxing ring trying to knock each other’s block’s off was a form of entertainment for kids of the ‘60s before such things as humanoid robots actually existed. So when Boston University’s alumni magazine had an article about dancing robots, I had to see what was up. As regular readers will know, I’ve been exploring some of the problems with reductionism lately. This idea, that humans and animals are just fleshy machines, breaks down when we try to design robots that can do some of the most basic of human activities. Sometimes we dance and we don’t know why. Apart from Wall-e’s dance with Eve, robots have trouble getting the concept. Graduate student John Baillieul notes that this isn’t about “some high school guy who had trouble getting a date, so you get a robot. The ultimate goal is to understand human reaction to gestures and how machines may react to gestures.” Having actually been a high school guy who never even got to the prom, I’m wondering how depressed our robots get when the fem-bots all look the other way. The reductionistic outlook suggests that we can eventually program robots to respond as humans would, responding fluidly to situations, allowing them to over-ride their “instinct,” which, the article implies, equals programming. We have no idea what instinct is. It is something all biological creatures have, from the heliotrope following the sun to the human dancing her heart out. Do we want machines to replicate our most intimate emotions? Even our most reliable chip-driven devices sometimes freeze up or rebel. My car has recently got the idea in its mechanistic brain that the right-hand side rearview mirror should be rotated as far to the right as possible. We bicker about this all the time when I get in to drive. Well, machines know best. They, after all, are the shape of the future. So programming robots so that they can react in real time to non-verbal cues, like all sentient beings do, is a desideratum of our mechanistic Weltanschauung. Notes Rich Barlow, the article’s author, “bats, for example, camouflage their motions so that they can sneak up on insect prey, a fake-out familiar to anyone who’s tried to swat a pesky fly.” My question is who is the pesky fly in this robot-human scenario? Who acts irrationally and unpredictably? Isn’t our instinct to smash the fly a result of our annoyance at it landing, yet again, on our sandwich with its dirty feet? And what is that stupid dance that it does when it’s all over our food? Reductionism must, by definition, reduce instinct to the level of a kind of genetic programming. Even this aging blogger, however, knows what it is to dance without knowing why. He also knows what it feels like when your date goes home with somebody else, something to which he’s not convinced that we want robots calculating an “instinctual” response. This entry was posted in Animals, Consciousness, Current Events, Higher Education, Just for Fun, Posts, Robotics, Science and tagged Boston University, instinct, reductionism, Rich Barlow, Robotics, Rock 'em Sock 'em Robots, Walle by Steve Wiggins. Bookmark the permalink. I understand why the concept of reductionism is important in the debate between those who see faith and science as complementary and those who do not. But does an opposition to “reductionism” really have any value to practicing scientists? It has always been easy to point to phenoma that defy current scientific explanation, but the history of science demonstrates over and over again that science has the ability to explain that which was once unexplainable. Our ancestors believed that gods or angels pushed the planets around the heavens because they could see no way to reduce such motions to scientific explanation. What can warnings of reductionism actually do for the practice of science? The quacks at the Discovery Institute are trying to make their own “science” of anti-reductionism with their flawed pseudoscientific concept of “irreducible complexity”. It was easy for Michael Behe to claim that a bacterial flagellum is “irreducibly complex”, but it took the painstaking research of legitimate microbiologists to show how wrong he was (the constituent parts of the flagellum can be found in other bacteria, performing other tasks). Perhaps philosophers and theologians see some holistic value in the claim that some phenomena are “irreducible”. But scientists are in the business of “reducing” the observable universe to explanation. What can anti- reductionism do for science except impede progress with pseudoscientific approaches such as that found at the Discovery Institute? Good questions and observations, Beau. I agree wholeheartedly about the Discovery Institute and the nonsense that goes by the title of “irreducible complexity.” And yes, I believe that scientists may indeed be able to explain much more of the universe as techniques and methods improve. My concern is more properly with materialism, which I lapse into naming reductionism. I should be more precise, I suppose, but materialism is a problematic term in its own way. I’m not sure the universe is all material. Science does not try to explain that which does not abide by the rules of materialism, so I guess what I’m concerned about is that which is outside the material realm. Creationism in all its forms is, and should be, a complete waste of time. Well, I would agree that materialism is a problematic term; but the problem is different depending upon whether one is speaking to a scientist or theologian. Scientific objections to the concept of materialism focus on the shifting theories and continued research about the nature of matter and energy at the subatomic level. Theological objections to the concept of materialism focus on the absence of spirit: souls, deities, angels, devils, and other spiritual entities seem to have no place in materialism. Scientific and theological objections to materialism are categorically different and should not be conflated.